Are you looking for party games for your debate party tonight? 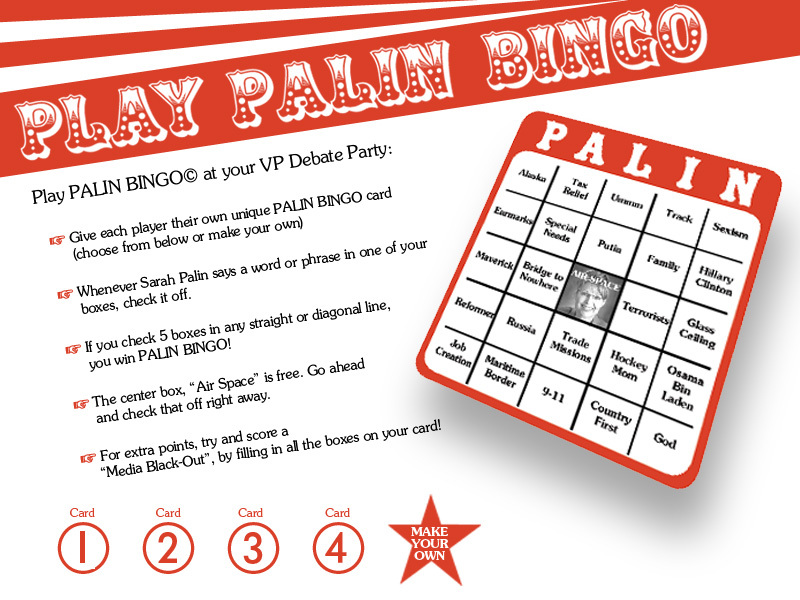 Try Palin Bingo! It should be a hit. I am meeting a friend for dinner. I called ahead to make sure they’d be playing the debate at the bar. But I really want to be at home live blogging the intellectual event of a lifetime. Now, I was all anti-blogger mixing politics with family drama 2 posts ago. But tonight is where it’s all fair game! Will she be wired with someone feeding her answers? No? OK. If you say so. I think I should start a pool to see how long it takes for her to “get back to” Gwen Ifill on one of her questions.